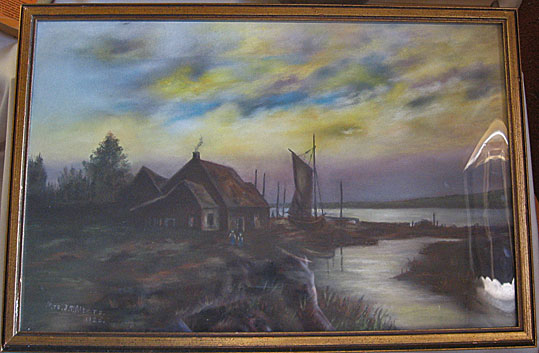 I've always had a fondness for pastel work, but this one is my favorite, especially that delightful sky. 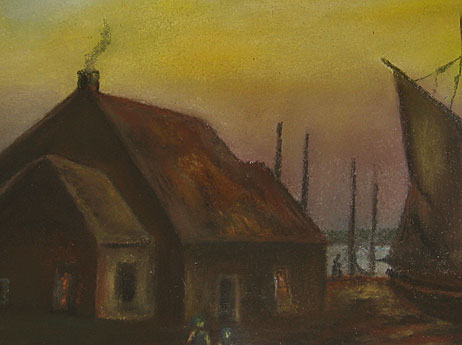 The image, unusually dark and rich for pastels, features a cottage by the water. 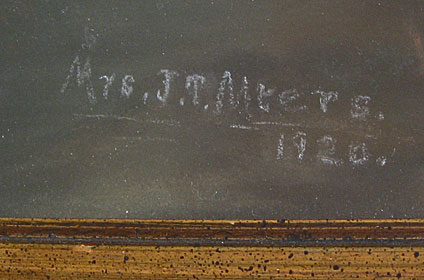 It's signed in the lower left: Mrs. J. T. Meyers 1920. This may well be part of that era when china painting and other art were favorite past times for women, though somewhat late in that period. 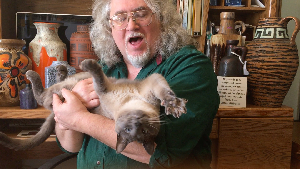 Mrs. Meyers may well have been an amateur, but she was certainly talented. The frame is a contemporary addition made of wood-look plastic, attractive as long as you don't contemplate it too closely. Size: Frame size is about 24 1/2" x 16 1/2" while the opening is about 22 1/2" x 14 1/2".